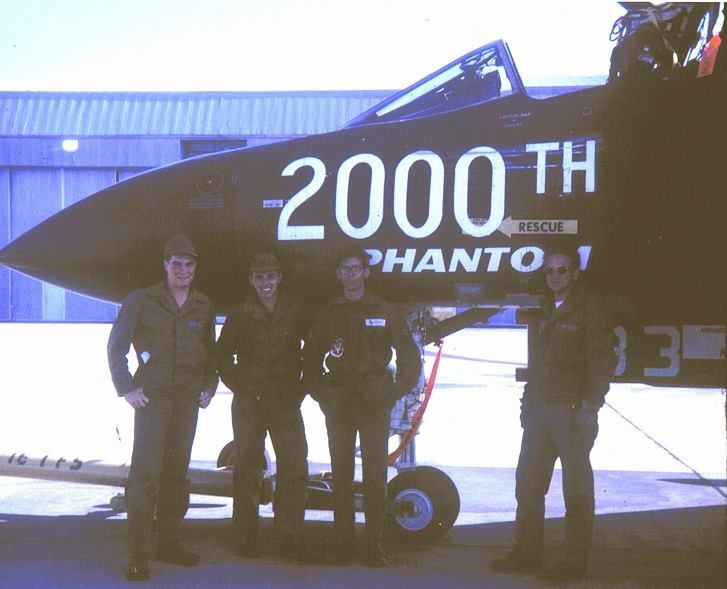 12 March 1967: McDonnell Aircraft Corporation, St. Louis, Missouri, delivered the 2,000th F-4 Phantom II to the United States Air Force. 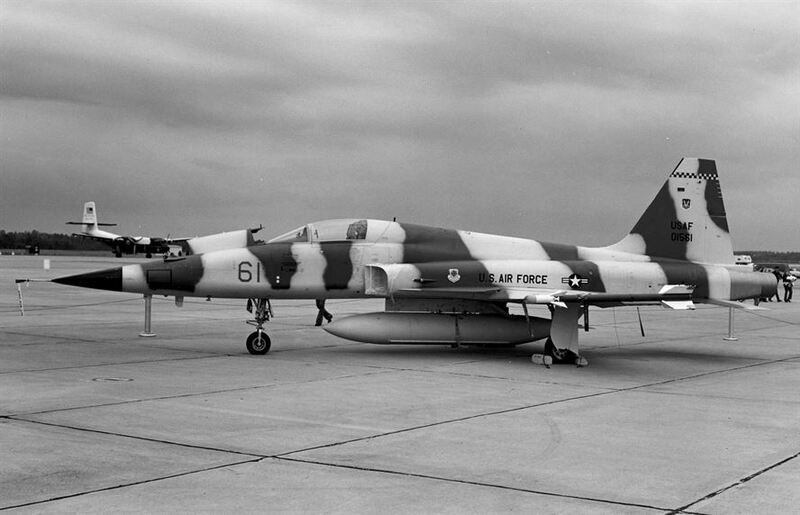 F-4D-30-MC 66-7533, c/n 2062, was assigned to the 40th Tactical Fighter Squadron, 33rd Tactical Fighter Wing, at Eglin Air Force Base, Florida. 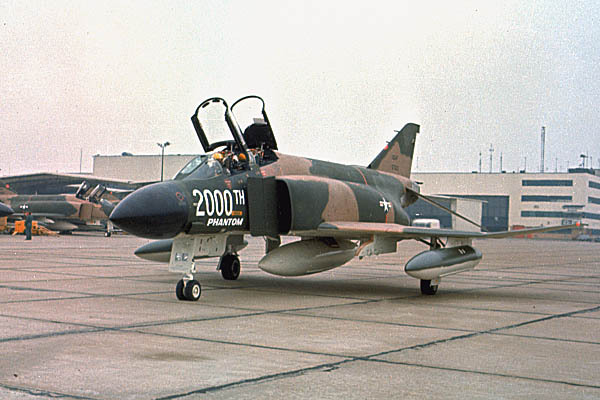 On 19 September 1967, the 2,000th Phantom II was being flown by Major Lloyd Warren Boothby and 1st Lieutenant George H. McKinney, Jr., of the 435th Tactical Fighter Squadron. Following a Rolling Thunder attack on railroad sidings at Trung Quang, about 10 miles (16.1 kilometers) north of Phúc Yên, 66-7533 was hit in the right wing by a 57 mm anti-aircraft cannon shell. The airplane was badly damaged but “Boots” Boothby fought to keep it under control for as long as possible. Finally, he and McKinney were forced to eject, having come within about 35 miles (56.3 kilometers) of their base. At the time of its loss, 66-7533 had accumulated 155 flight hours on its airframe (TTAF). 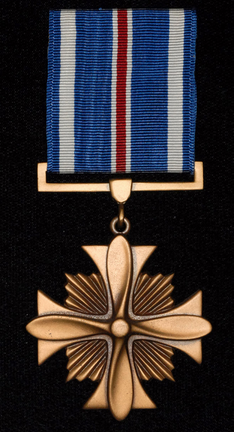 For their airmanship in trying to save their airplane, Major Boothby and Lieutenant McKinney were each awarded the Distinguished Flying Cross, which was presented to them by President Lyndon B. Johnson, 23 December 1967, in a pre-dawn ceremony at Korat Royal Thai Air Force Base. “In the hail of AAA over the target seven miles north of Hanoi on that day was a ‘Golden BB’ which opened a three-foot hole in the Phantom II’s right wing, froze the right spoiler full up, immediately drained two of the three hydraulic systems and generally turned the day to crap! I mumbled an egress heading (and a few dozen prayers) while ‘Boots’ used every increment of incredible aviation instincts, honed by countless hours at the edge of the envelope, to keep the F-4 airborne and headed away from the ‘Hanoi Hilton.’ Doing so required full manual depression of the left rudder pedal, and holding the stick within one inch of the left limit of travel. —USAF F-4 Phantom II MiG Killer 1965–1968, by Peter E. Davies, Osprey Publishing, 2004, at Page 75. That quote may seem a little extreme, but Colonel Boothby was referring to the Air Force’s urgent need to improve fighter tactics training, balanced against safety, but not at the expense of effectiveness. Colonel Boothby, who passed away Nov. 26, was an experienced combat pilot and an academic instructor in the 57th Fighter Weapons Wing in the early 1970s. He looked at the Air Force’s declining kill ratio from Korea to Vietnam which was 2.4 to 1 in Vietnam compared to 8 to 1 in the Korean War. He led the effort to fix it. This involved several key steps, starting with a thorough analysis of the engagements over Vietnam. Colonel Boothby led a series of studies at the Tactical Fighter Weapons Center, which were part of Project Red Baron, examining each of the war’s air-to-air battles. While the subsequent reports noted many accomplishments and even more lessons learned, they highlighted several significant trends. The colonel’s team discovered that pilots of multi-role fighters tended to have such a diverse range of missions that they seldom had a chance to master air combat tactics. They also noted pilots who were shot down rarely saw the enemy aircraft or even knew they were being engaged. Additionally, few U.S. pilots, before flying into combat, had any experience against the equipment, tactics or capabilities of the enemy’s smaller, highly maneuverable fighters. Under the DACT program, Air Force officials had some T-38s painted with Soviet-style paint schemes and flew them based on adopted Soviet tactics. 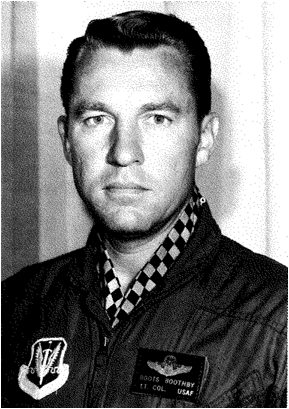 Because of his combat experience, academic instructor background, and involvement in Project Red Baron and in developing the DACT program, Colonel Boothby served as the first aggressor squadron’s commander when the 64th Fighter Weapons Squadron activated Oct. 15, 1972. As an instructor, Colonel Boothby proved himself an effective teacher who relished the attention of his captive audience. Ever-animated and quick with a joke or “fighter” story to make a point, he told the pilots he was instructing what they needed to know to succeed. These qualities ensured his students’ attention remained spellbound and eager. One former student recalled one of the colonel’s more popular attention steps. In typical fighter pilot stance, using his hands to represent a dogfight, he would spray lighter fluid from his mouth across his right hand (palming a lighter at the time) and literally flame the left hand and wristwatch bogie. He generally walked away with a few singed hairs on his hand, but his students received a magnificent visual demonstration of the seriousness of air combat. Such object lessons ensured this charismatic instructor’s students learned and retained the knowledge they might need to save their lives one day. ¹ Mr. F.C. Straile informed me that he crewed McDonnell F-4D Phantom II 66-7533 with the 4th Tactical Fighter Squadron at Eglin Air Force Base, Florida, and transferred along with it to the 435th TFS at Ubon RTAFB. Thanks, Mr. Straile!